What can today’s polls tell us about next year’s election? Quite a lot actually, but only if read carefully. That’s what we try to do here at Elections Etc, combining the polls with analysis of previous elections to predict what will happen on 7 May 2015. Steve has been blogging analysis of polling and election-related issues for a while over on Blogger, and first launched his 2015 forecast in October there. This will be that blog’s new home. We’ll be posting regular forecast updates as well as articles explaining the methodology behind them and looking at some of the questions they throw up. For now, you can read a brief description of the model here, or a more thorough description in Steve’s working paper. 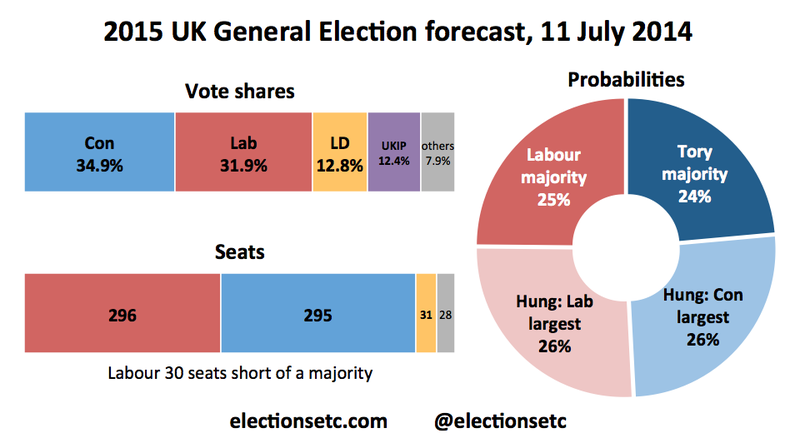 We’ll update our forecasts every Friday, at least to begin with – follow @ElectionsEtc on Twitter to stay up-to-date. Each update has three parts: vote shares, seats and the probabilities of key outcomes (Conservative majority, hung parliament, etc). You’ll always be able to find the latest forecast here. Our central forecast today is for the Conservatives to win the most votes, but Labour to win the most seats – albeit 30 seats short of a majority. The model gives the two parties roughly equal chances of emerging as the largest party: 50.8% for Labour and 49.2% for the Tories.